It is obvious that Tadgell’s sisters are not biologically related: Tayja is black, her hair in a topknot ponytail, while Mia is lighter-skinned with bright green eyes and tousled, short dark brown hair. But nevertheless, the two are real sisters—adoption made them so. Lambert’s purposive tale follows the two as they play a game of pretend princesses climbing a mountain (the sofa). Mia is still getting the hang of pretending (she thought the word was “betend”), so when she suggests they pretend to be sisters, Tayja holds Mia’s face in her hands, the two touching foreheads, and states, “No, Mia—we don’t have to pretend that. We are sisters. 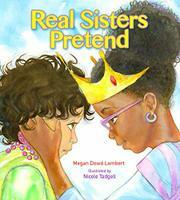 Real sisters.” She then helps Mia recall how they were adopted and became sisters and addresses the issue of outsiders’ comments and queries. (Further pushing the diversity of this family, it is headed by two moms.) The story is told entirely in the color-coded dialogue bubbles between the two sisters, which means the girls sometimes sound stilted and unnatural. But their interactions and pure joy in togetherness are anything but in the watercolor illustrations. Note: Lambert is a freelance contributor to Kirkus.